I’ve been working on an issue over the past couple of days where a backup has constantly been failing. 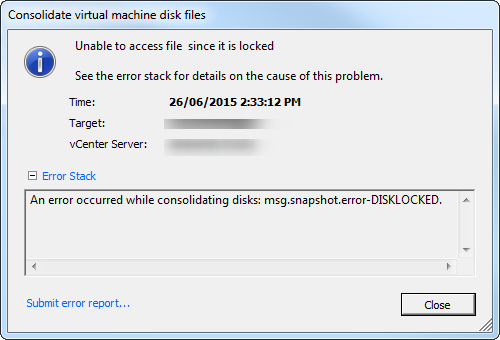 the problem was isolated down to the fact that the VM has a warning that it required disks to be consolidated. Nothing major, or so I thought. I had a look at the datastore where the VM resides and it has 185 snapshot vmdk disks. Well that can’t be right! So I did a bit of investigation and found a number of VMware KB articles around the problem. The basic option is to follow KB 2003638 and just run a basic consolidation by going to Snapshot -> Consolidate. You’ll then be prompted to select Yes/No as you’ll have to consolidate the Redo logs. Select Yes. At this point it looked as it the consolidation was going to work but at about 20% it failed. The next error shows that the file is locked.